P1000088, originally uploaded by ANNYIA. 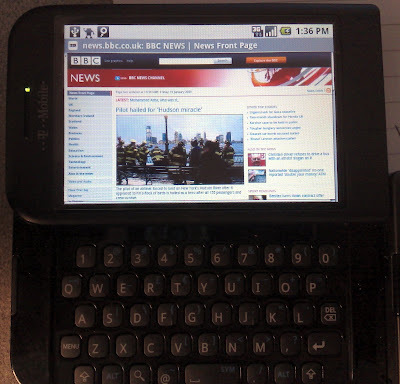 The mental synchromesh has more or less stopped working in the transition from N95 to G1. It's quite a change in OS, display and form factor and a jump from a fairly well established phone to a new 'device'which still has some teething trouble. 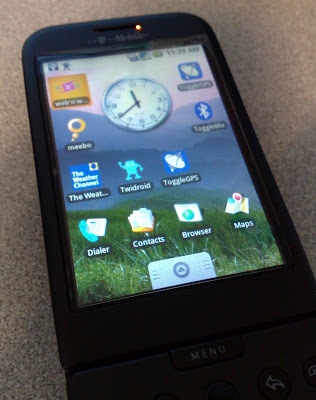 The G1 is a great web device. Browsing is excellent: it's easy to browse more 'full' web pages instead of PDA/smartphone versions now that page navigation and display is much easier. 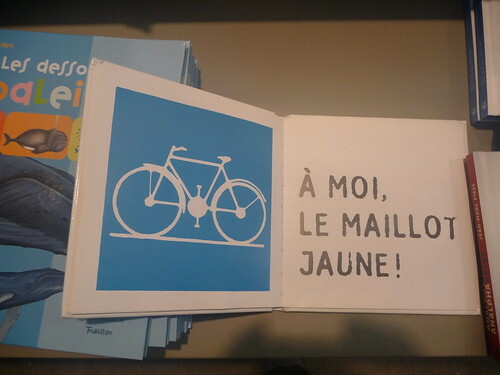 There are a few pages which don't really work but most of what I see is fine. Missing, however, are most of the add-ins like flash. Hopefully these will turn up pretty soon either as applications or as add-ins to the OS. 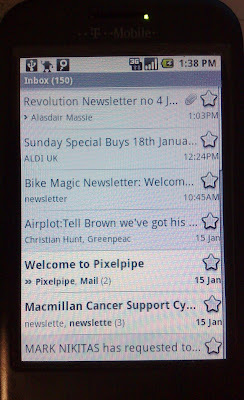 Google apps work well- I was using mail, reader and iGoogle on the N95, but now I also use contacts and I'm going to look at calendar. Relying on a single vendor for all my personal stuff is a little dubious but the disadvantages are outweighed by the convenience of having everything available via phone or pc. Maps is excellent too, I'm just waiting for google to launch streetview in the UK. Beyond the browser, there's a market full of apps to download, currently for free. Some are good, some don't work or are really crap. Time and evolution will tell which survive but the combination of cheap, easily accessibly applications should drive usage. 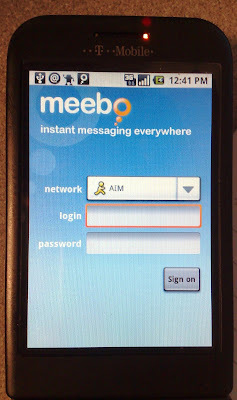 Meebo- looks a good IM client but seems to have difficulties and crashes when moving between 2g and 3g. I'll try it out once I've sorted out wifi at home. Weather channel weather report. Seems ok, can pick up location using GPS. It will be interesting to see how this compares with a shortcut to the BBC weather forecast in the browser which I would usually use. Accuweather looks good too- same sort of content. 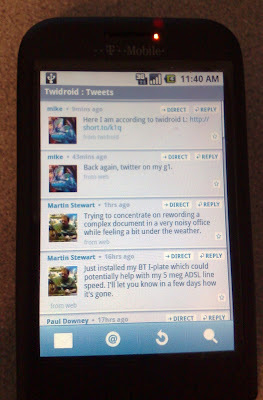 Twidroid- Twitter client, includes location awareness. Seems to work well, new twitter indications appear in the status bar. Other twitter clients are available too. 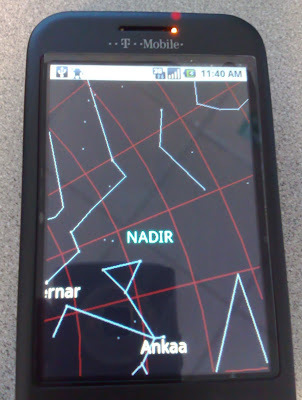 Sky Map- map of the sky showing positions of stars, constellations. Location aware and links with the position sensors so that you see the star layour in the direction you're pointing the phone. I like this app, having been looking for an easy to use star map for a while. StreamFurious- Good streamer for shoutcast. A bit short of other radio stations though. 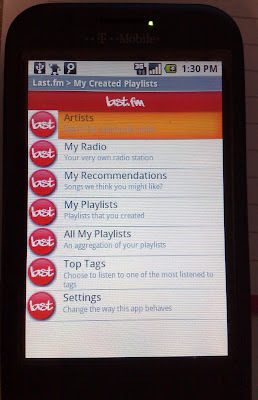 last FM- a good looking client which doesn't work very well. Nice idea, hope the client gets sorted out soon as I'll use it lots. 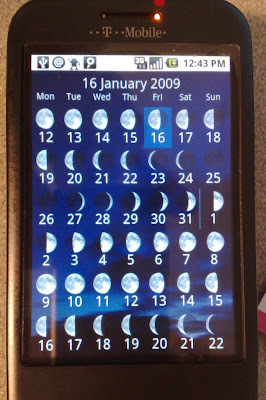 Lunar phases: moon calendar showing phases of the moon, because I want to take photos of the moon. Pixelpipe- uploader for Flickr, blogs etc. 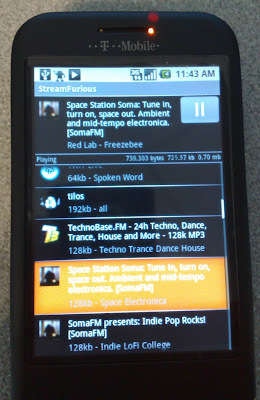 Still working to get this installed and working properly but it looks good. Toggle GPS/WiFi/Bluetooth- simple on/off switches for bettery-eating applications. Cellfinder- shows map of your location and the cell you're connected to. Usful for cellular geeks. Photostream/PicPush - uploader for Flickr. Wheeler- bike ride trip recorder. Not as good as Nokia's sportstracker. 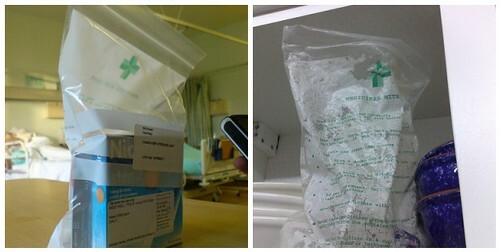 g1 doesn't receive quite as well as the N95. Browser and app activity when shifting between 2G and 3G is variable. Bluetoth support is pretty crap, I couldn't connect the G1 to my N95 or send files to/from the g1 to my laptop. The g1's camera is, well, shite. 3MP, no zoom or flash. 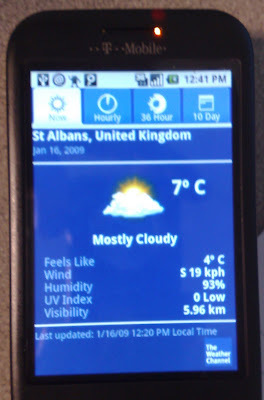 It's so bad that I'm currently not using it and am still carrying my N95 just to take pictures. 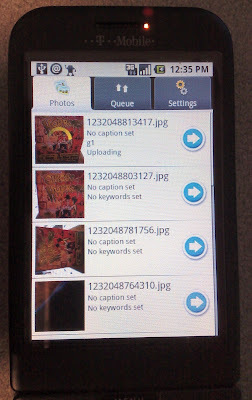 Fail, fail, fail in design spec here, even low end nokia cameras are better than this. Overall it's a good start for Android, shame about HTC's build of the phone but other manufacturers will do a better job. The G1 isn't a phone for Flickr'ing, sadly. Now, if LG broughy out an Android Renoir, that would be a flickr phone.